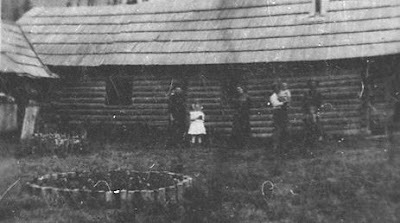 Caspar Berray homestead when Helen was a youngster. Courtesy Frank Berray collection. 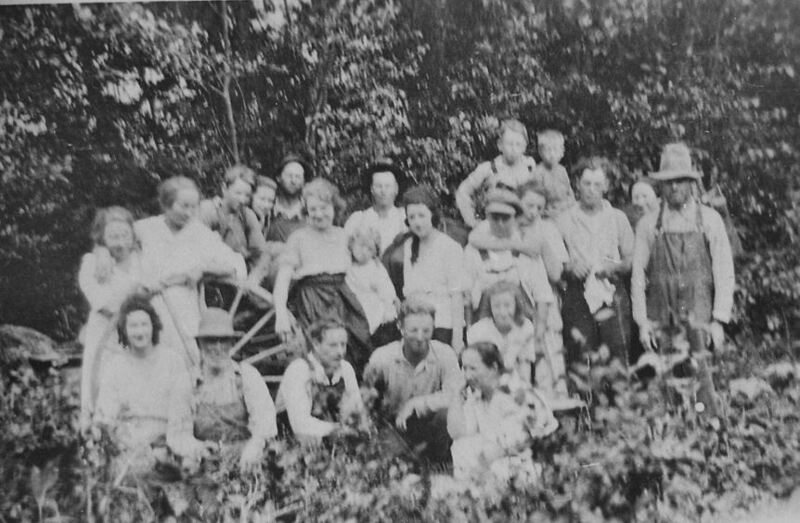 Education was one of the hardest things to acquire in the Bull River valley for the scattered homesteaders, each with their 160 acres of natural meadows and forest lands. Their log homes and barns were miles apart, even when as many as possible squeezed into the narrow valley bottom land bordered by St. Paul, Chicago, the Billiard Table, and Ibex -- the peaks that formed the awesome, rugged, towering Cabinet Mountains. "The folks had to battle the county commissioners to get any schools there. I was over ten years old before I got any schooling, and then went to school only because friends took me to board with them a few miles north, in Lincoln County," Helen Kirschbaum said. "I and Clara Collogan boarded with Harry Tallmadge's folks (Mr. and Mrs. Stanley) and went to school in a little old log schoolhouse with home-made desks fashioned out of split cedar. We learned to read, write and do arithmetic."1. In 1909, a box stove heater that wasn't long enough to use wood cut to three-foot cordwood size warmed the three students, Helen, ten years old, Clara, six years old, and sixteen-year old Roberta Downing. Firewood was cut in different lengths; shorter for kitchen range fireboxes and round heater stoves; longer for some box-stove heaters, shorter for others. The stove's shape determined what lengths wouldn't allow the firebox door to shut. Wood burning stoves commonly used in Sanders County schoolhouses had a 11" wide by 26" deep firebox. In 1910 the first schoolhouse in the Bull River Valley, Sanders County, was built on Algie Berray's homestead. Jim Finnigan was the carpenter. While hauling the lumber for the building Frank Berray was injured when the team of horses unexpectedly backed up, and pinched his foot between the wagonload of lumber and a stump. The accident crippled his foot and put an end to the feisty young man's log driving days, and left him with a lifelong limp.2. His little sister, Helen, remembered the school, "It was two and a half miles from my parents home. School began in May and went four months. I walked every day, both ways with Josephine Bunn, our first school teacher in the new schoolhouse." The pretty young teacher took her board and room with Helen's parents, Cap and Julia Berray. 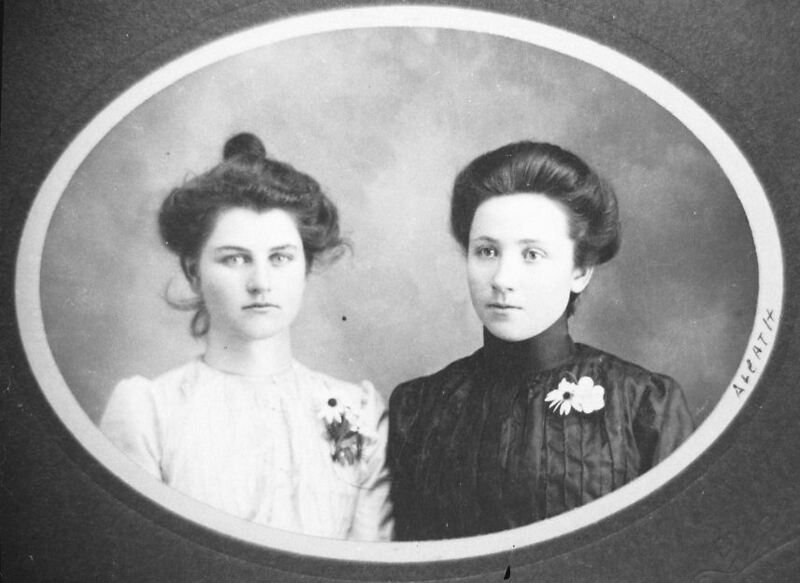 Helen Berray and Aleatha Bauer, circa early 1900s. Courtesy Clayton Bauer collection. "We used catnip tea for fevers, congested lungs, pneumonia," Helen said. "We'd fry onions soft, to absorb lots of grease, put them into a cloth sack and put that on the chest as warm as could be stood. We also used a poultice out of Denver Mud (that the folks bought through mail-order) for lung troubles. "And mustard plasters made by mixing a tablespoon of dry powdered mustard with three or four tablespoons of flour and a little warm water to make a paste. Spread it thinly on a soft piece of cloth and apply that to the chest, front and back, for a few minutes. Watch the skin close and let it just barely turn a light, light pinkish color. Then quickly remove the mustard plaster, sponge the skin with warm water and apply a bit of mentholatum ointment, or lard mixed with kerosene."1. "Christ, that would be a good way to scald the hair off a hog!"2. Helen said, "I gave mother aconite and belladonna and Gelsemium for her heart after I was ten years old. You could get it from the druggist those days if you let him know you understood their poison qualities and how to properly use them. There were no doctor's prescriptions or the likes of that. "Mother was sick so I had to learn to give her medicine to her. There were no droppers in the bottles in those days. You had to drip one drop from the bottle into a teaspoon. If I wasn't certain sure I had only one drop I had to dump it out and wash the spoon and start over again. One drop every hour for her heart trouble. I had to give her aconite and gelsemium, alternately three drops ever three hours, for headaches and fevers and such. It was a big responsibility."1. Frank laughed aloud when he said, "Old Man Saint used to hang a bag of aspen around his neck to ward off colds. You could buy it. It was brownish black stuff. Stink - Holy Jesus, you couldn't get near him. Smelled like garlic. I believe you couldn't catch anything with it on."2. A Noxon outing with the Bauer families. Tom Moonen is the man on the right in bib overalls. Courtesy Clayton Bauer collection. In 1911 George Baker homesteaded on Bull River, adjoining the northern boundary of the 160 acres Frank Berray was homesteading. Frank and George each batched in their own snug two-room log cabin, about a mile apart. One day Frank rode over to George's on horseback to compare notes just before George left for Helena. Then, when George returned he had a wife, two girls and a boy with him. "Well this boy was twenty one years old," Frank said. "So I said, 'Say son, if you want to homestead up here, I'll just take you down and show you a darn good place that you can homestead.'" They spent a couple days in the saddle looking over the old Green property with Frank urging the young fellow to take it back from the forest service. Frank reasoned that the senator would uphold the claim if it was proven the land was agricultural. "Which it was," Frank said. "But the lad got cold feet."2. Frank's own dispute over homesteading didn't prevent him from finding employment with the forest service. "I worked on that Berray Mountain trail, the one that goes right up out of the North Fork. About 300-400 yards straight up that mountain there's an old mine. You can see the diggins on the side hill there. It [the trail] goes up on above to the peak. Well, I worked on that trail and cleared it out alone within about a mile of the top. Then I come down and started working on the trail that went up the South Fork. I patrolled that whole country in there for the forest service for two summers, 1911 and 1912." A good many men couldn't hang onto their wages and John Erickson, a hard working Swede who knew his weakness for drink, gave his forest service earnings to Cliff Weare to keep for him. Erickson kept $20, which he took to the saloon, but he admonished Weare to save the rest for him. "In an hour, Maynard came from the saloon with a bill for $20 against Erickson's savings," Weare said. "I wouldn't give 'em to him. Maynard left and then returned with Erickson who said to go ahead and pay it. I just gave him the rest of his money and wouldn't have any part of it afterwards."3. There were Chinese in the area, people who had come to build the Northern Pacific railroad, and stayed to work for the railroad, rework old mine diggings, or whatever they could to survive. In the term of the day, they were called "Chinamen." A story is told of a Chinaman who came into C. R. Weare's Post and Poles Store and asked for 'salts'. Weare handed him a package of salt. The man refused, saying only, 'Salts.' Weare again offered him the salt, pouring out a few grains and motioning to taste them. Still the Chinaman refused, saying with great exasperation, 'Salts! Big Shits!' "He wanted Epsom salts for a physic," Cliff said.3. During breaks in the fall rains, while Birdseye was poisoning rodents, Dave Morgan, Assistant Game Warden, and Harry J. Vaughan, Representative, planted more fish fry in Pilgrim Creek, Beaver Creek, Trout Creek and in Martin Creek, and in the mouth of Bull River. The men dumped the shipment of 150,000 fish fry (young fish) from tanks of water hauled in on the railroad, into water barrels, which they transported by horse and wagon to the locations. Hunting season provided plenty of camaraderie for the men, and plenty of meat-preserving for the women, and practically before they realized it the middle of winter had set in. Cabin fever was thwarted during January 1912 when the Noxon ladies spent pleasant winter afternoons at 500 Club meetings planning community improvements and socials.4. Womenfolk living on homesteads never made it to town to share their afternoon camaraderie. In February Dr. Fester (sic) arrived from the Bitter Root Valley and opened an office in Noxon. During the time Fester had his office at Noxon a fellow by the name of John came to town to get a gallon of whiskey.5. Death in the form of wood alcohol poisoning stalked John and five other men during the holiday season. "Comstock and Charley Walker had bought a five gallon barrel of liquor and sold it, unaware of what it truly was," Clifford Weare said. John, who lived in the Bull River Valley and was known as "Frenchy" went to Noxon to get a bottle. "When he came across the ferry he opened the bottle, offering a drink to Ed Hampton, the ferryman. Hampton, not being a drinking man, refused. Frenchy took a drink." 'If that razor pulls, just say something."7. An Irishman named Mike Conners died, but the other men remained unnamed. No charges were ever filed in the case. Charley Walker lived in fear of being arrested all the rest of his long life. Dr. Fester (sic?) kept his office in Noxon only three weeks. He left when his dealings for a ranch fell through, moving to Thompson Falls where he opened an office. Noxon residents also bid adieu to John McKay when he moved to Twin Bridges. School in Noxon closed the first week of April. 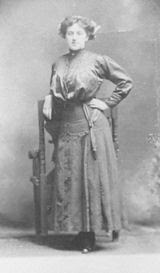 The teacher, Miss Hattie McDonald, went to Bull River where she taught school for one month and then left for Eureka to teach. A new school was being built a mile south of the Bull River Guard Station on a spot known as Pilick flats. Until it was completed, she held classes in the school building on Algie Berray's place.8. Hot summer sun urged women and children to start early while mornings were cool. They returned home sweaty, with ruby stained fingers and mouths, sunburned and scratched hands and arms, and aching backs; rewarded with black-ripe dewberries plucked from thriving thorny vines, green leafed and ground hugging on recently burned over areas in the forests. In July a thief stole two dozen Rhode Island Red chickens from Mr. Huffman's hen house.8. In August, a fortunate few from Noxon went to Missoula to see the "greatest show on earth," the Barnum and Bailey Circus. Thousands of Montanans lined the parade route to watch the million dollar parade. In glittering costumes, and jeweled harnesses and wagons, the likes of which had never dazzled the eye of most Noxonites, 1,300 people, 700 horses, 40 elephants and 1,200 other animals awed those who saw it. The show cost its owners $3,500,000 and required five long trains to transport. All but twenty of the circus people traveled directly with the show. The Noxonites succumbed to the allure seeing of man-eating lions, leopards and chimpanzees, and sampling strange food. They went home and told almost unbelievable tales of hawkers urging them to see shows inside the tents of tattooed ladies, fat ladies, sword swallowers, giants and midgets, and half a hundred other amazing games at which you could win prizes, and challenges they'd never dreamed of before. Ethel Tallmadge at age 16. Many of the not so lucky settlers, by and large the majority, remained home where they got sticky, dusty and hot from hacking thistles around their houses to comply with a Montana law. It mandated yards be kept clear of the pesky prickly plants that could grow as high as a man's head. They slashed down fuchsia-colored tufts crowning dark green buds, clustered on each mature Russian thistle plant that would burst into ivory blossoms that produced millions of seeds. Each seed hung from a tiny-stemmed, minute, fuzzy parachute ideally suited to floating aloft on the slightest breeze, before landing on fertile soil. Eradicate them, the state said. Kids puffed the parachutes, thrilled by the hordes of drifting seeds on the hot summer air and unconcerned that the seeds would foster another wasted patch of land.9. 1914. Courtesy Harry Tallmadge collection. Each spring settlers met at the cemetery to clean out buck brush and grass, to find graves and tend them. The newest cemetery, on the Pilgrim Creek hill, was leased from the forest service. The old one on the flat by the river wasn't used anymore except for burying Chinese. When Alfred Baxter died in 1913 he was buried on the hill. After Baxter's funeral, the stores, which had closed in respect for the family, reopened. Johnny and Charlie Knutson got the harness out, put it on their pet steer, and hitched him to their delivery wagon. They hauled groceries for people from Buck's store, taking turns riding on the gentle animal.10. Harry Tallmadge, now 21, worked as stock and delivery boy for a store in Troy, Montana. Sometimes his job included hauling dead bodies in his horse drawn wagon for the county coroner, Harry Gump.11. Dr. Peek, Thompson Falls, swore out a warrant against Dr. William Knapp, of Hope, Idaho, on whom the settlers relied heavily. Knapp was placed under arrest November 20, "charged with practicing medicine without a license in the State of Montana." Sheriff Moser took the train to Hope and brought the doctor to Thompson Falls. "It was claimed he [Dr. Knapp] came across the state line from Idaho to Trout Creek to attend some cases of typhoid fever," the newspaper reported. He was found guilty in Judge W. C. Adam's court and fined $50.00.12. This affected all of the small towns in the west end of the county since medical help was so scarce. Noxon had Mrs. Buck, who it was rumored lacked only her surgical degree in medical training before she came to Noxon. Dr. Peek was in Thompson Falls. Mrs. Allan and Mrs. Bauer were midwives. All around the tiny settlement times were changing rapidly in 1913-14. Georgia Knot, who'd gone to Missoula to take grades 11 and 12, graduated. The Montana governor sent her a congratulatory letter for being the first Sanders county student to complete 12 grades of schooling. Religionism, education, and women's voices were taking a toll of the 'good old days' when a man could drink himself into the blind staggers and suffer no disgrace for it. Kootenai County, Idaho, was "voted dry by a 405 majority" March 11, 1914. Twenty four saloons, six wholesale houses and one brewery would go out of business within ninety days.13. While men were getting 'tamed' members of the younger generation were throwing off constraints in their own fashion. 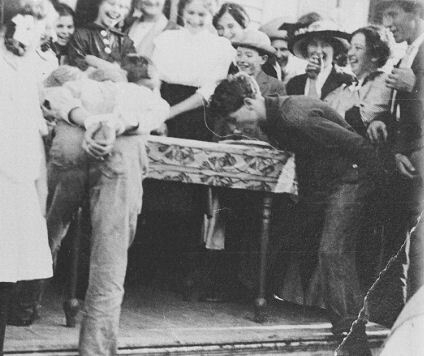 The generation gap reared its head in the valley when youngsters took up the newfangled dancing - ragtime - which had become popular in eastern cities. Dancing the "old time way" was to fiddle and piano, with a "caller" standing with the band who called out dance patterns in rhythm to the music. Sets of partners formed a circle and danced a pattern to the words of the caller. All join hands and off you go." Do the willowy Bunny Hug. Hold her tight don't let her fall. Be as graceful as a cow. Now the tango. Come be quick. See how high you can kick. That's what's termed a dance today."14. "forbidding 'ragging' and other objectionable methods of dancing," and added a fine for infractions.15. "This system of dancing has been in vogue for two years - if parents favor ragging by the young people, let them petition the council to undo their work, and hire an instructor to teach modern dances properly, thereby doing away with such vulgar exhibitions in another manner than by force."16. C. H. Norton, unperturbed by the temporary banning, began building a dance hall and roller rink in Thompson Falls. He had No. 1 hard maple flooring shipped in from the east for the 80'x40' building. (Years later Norton would move the building to Noxon.)17. Plains Saloon, Bill Finnigan proprietor. Circa early 1900s. Courtesy William Finnigan collection. Perhaps it was a good thing there were dancing and gatherings to enjoy for often there was little else. Forest Service sales for post-making generally were fire-killed cedar rather than live cedar trees. Cedar posts that were hand-split from fire-killed trees were referred to as "burned posts" and making posts from fire-killed cedar was dirty work, but like many other homesteaders, Baker worked long and hard in the Bull River valley, trying to make a living with them. Swan Swanson told of staying overnight with the Baker's when he was enroute to Troy with the banker of the Court Exchange National Bank. "We got stuck there and slept in the house. We had to sleep on the floor. Mrs. Baker charged us $5 a piece. Well, they didn't have a damned thing. In the morning they gave us oatmeal. Didn't even have milk for the oatmeal. Baker had a lot of burned posts there he wanted us to buy, but I couldn't buy them." Shoveling a path around the post piles after a winter snowstorm so they can be counted. Courtesy Harry and Sarah Tallmadge collection. Cases of hard times could be found, but were cockroaches enough of a problem to homesteaders that the newspaper published the following solution devised by "Uncle Samuels scientific department," or was the editor joshing? "Fill a saucer with a mixture of flour and plaster of Paris. Nearby another saucer containing water and some little pieces of wood floating about. The roaches will eat the plaster and flour; this will make them thirsty, whereupon they will drink the water and the mixture will harden inside, and there you are with all kinds of plaster of Paris cockroaches. P.S. - if you are short of water stale beer will be even better."18. "The extermination of the winter fly is the duty of the housewife and of everyone. Don't let one escape. Catch and kill them all before spring, for the winter fly is the parent of summer's destructive swarms. Capture every one of the filthy little pests you can." Flies cost the United States annually $350,000,000.19. "Fly Wisdom" became a column devoted to the hazards of flies. Flies follow filth; fever follows flies. A fly in the milk may mean a member of the family in the grave. It is a short haul from the garbage can to the dining table via the fly route. Flies, as well as bad weather, spread typhoid. If at first you don't succeed, swat, swat, swat again. If your aim was poor you could "put two teaspoons of formaldehyde to a pint of water. Place saucers of it around the house."20. During the worst of the fly season the Weare's moved out of Noxon and homesteaded on the north side of the Clark's Fork River. Shortly afterwards, Joe Hammon homesteaded property adjoining Weare, near the Beason's and Urie Ellis' places. Herman Manicke bordered Ellis. During late summer and early fall, from early morning until sundown pounding hammers banged out staccato rhythms in Noxon. The smell of fresh-sawed lumber hung on the air 'down town' where Dr. Peek was having a building erected. It seemed like every man around for forty miles became a sidewalk superintendent when in Noxon on business. 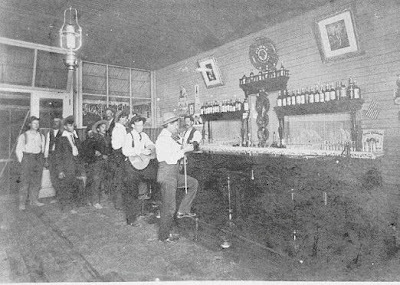 The 34' x 50' building was built so close to the west side of Maynard's Saloon on main street that men could almost step from the outside stairway leading to Peek's upper floor onto Maynard's roof. Peek established a mercantile store on the lower floor, while the second floor was used for dancing.23. 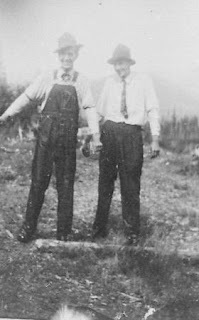 In September 1914, Eddie and Carrie Gore moved from Coeur d'Alene to a homestead on the slopes of Green Mountain, a few miles east of Noxon on the north side of the river.21. "We shipped our furniture to Noxon and stored some pieces, until spring, with Mrs. Baxter who had a hotel. "That fall and winter we lived in a tent with all the sides boarded up and covered with tarpaper on the outside. It was nice and warm. We had a double floor and linoleum on it. Eddie worked in a cedar camp making cedar posts," Carrie said. Eddie also entertained the residents with the acrobatics and clowning he had learned during a stint he'd spent with a circus.21. Noxon pie eating contest: Contestants Solon Ellis and Clayton 'Clate' Bauer. Mac Mathey is pictured on the right, Art Hampton is the lad in the hat, and Pearl Maynard is laughing in the background. Courtesy Clayton Bauer collection. "Thrice in one week the Noxonites had the privilege of hearing campaign and socialistic oratory. Monday evening a socialist speaker was with us. Wednesday, the Republicans rallied here and before we thoroughly digested all they told us, along came the democrats, explaining and lauding democracy. Now the voter knows all the several candidates so he should be able to vote wisely." One hundred three voters were registered. Since women weren't allowed to vote, Carrie was more interested in the Blue Ribbon Literary Society organized at the Noxon school. She didn't get involved in the usual Halloween pranks which the newspaper reported, "took most of Sunday to undo."23. "one of the best lectures ever heard in Noxon to a good size crowd. She thoroughly explained all the measures to be voted on by the people of Montana. She also gave a pathetic picture of the Ludlow 'Massacre', and promised to stop on her return trip."23. On the first Tuesday in November Noxon voters cast 78 ballots in the election and the women's suffrage amendment carried almost unanimously. Peek's new hall was opened Election Day night by a big free dance and supper. Kelly's orchestra from Thompson Falls provided the best dancing music in Sanders County. Mr. and Mrs. Collogan from Bull River came for the election and stayed for the dance, where about 125 persons were counted at suppertime.23. Charlie Munson and his car at Noxon. Circa 1920s. Courtesy Charles Munson collection. The women were joshed good-naturedly about the amendment before talk turned to recounting the summer's activities. Everyone who came to town that day, it seemed, inspected Charlie Munson's 1914 Ford. It was the first car in Noxon.24. "Hey, Munson, see you turned your hayburner in for a gasburner! When you gonna give us a ride in it?" They chewed the rag about the new store, and hashed over the pros and cons of cooperatives, an idea imported with Russian immigrants that was gaining national notice. Only by banding together were Americans going to survive, was the theme of cooperatives. And their merry ways of dealing do not suit you. Cease to blame it on the Senate or the weather. 'Get Together!' That's the answer. 'Get Together'." Two more stanzas followed, penned by Berton Braley.25. Along with magazines and other publications the settlers were reading, a new seed was sown in the community, and would soon sprout dissention. The latest community news passed among the socializing dancers that evening included Reverend Lang and a man named Williams were working on the new parsonage; Jim Finnigan built a house on two acres he bought from Evans; James Bauer, who had become almost entirely blinded by a cataract on his only good eye, went to Spokane for treatment. A few days after the happy election evening dance, Frank Berray's horse ran against a telephone post, knocking Frank out of the saddle and under the horse's hooves. He sustained a serious head wound that required all of Cap's skill to nurse his son back to health. As Cap sat by Frank's bedside during the worst nights, it hardly seemed possible he'd been out here in Montana's wilderness more than 21 years. Newcomers referred to him as "old timer" now. The struggles had been hard, he reflected, but altogether it had been a good life. He thought of the baby daughter buried on the hillside. He couldn't bear to lose his son, too. It was slow going, but Frank did recover.26. If the Berray family planned to attend the meeting when the Noxon Socialist local was formally organized on November 23, 1914, Frank's injury prevented it. Heron's Socialisdt local also organized. Members became active holding many meetings. A new direction in politics was beginning to make itself known, fostered by alarm over events in the world war raging in Europe. Many men and women feared they were luring this nation to increasing involvement .27. George Hampton bought some goats on Bull River in November, and while loading them into his wagon, his team became frightened and bolted. One horse was seriously injured. A veterinarian called from Plains a day or so later said the horse was "not likely to recover."28. The loss of half of a team of horses created serious hardship. Wagons and carriages required horsepower, thus restricting travel to horseback. Also, haying, logging and many other farming tasks depended on a reliable team. During the 1914 fall term of court while Weare was suing Jess Beason, and winning $83.65, P.A. McNeeley took Western Montana Lumber Company to court. They settled out of court for an undisclosed amount.29. Cutting, hauling and storing ice from the frozen Clark's Fork River, and fine ice skating on Noxon slough were the order of the day in mid-December. The ferry was unable to operate much due to floating ice on the river.30. Teams used to skid loads of logs out to the banks of the frozen Clark's Fork River, where the log decks awaited springtime high water. Courtesy Don Maynard collection. 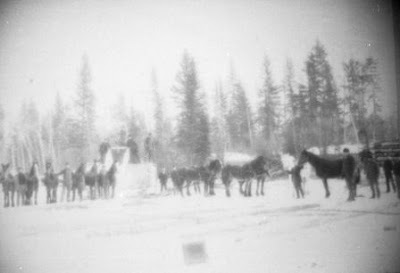 Caption: Hauling winter ice harvested from the slough for Marion Larson's ice house and Marion's Tavern. Circa 1920s. Courtesy Norman and Betty Larson collection. While the war gripped Europe, in Noxon another year passed only slightly touched by events outside the confines of the valley. True, travel wasn't quite as easy as it had been with the Dinkey in operation, but Harvey Schench, who had spent the winter holidays at the Baker ranch in the Bull River valley, left on the Monday train for Sandpoint. The railroad still remained the only means of leaving the area during the winter. Most settlers remained undaunted by the two feet of snow on the ground. 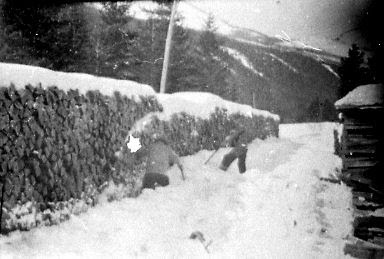 Men, adept with snowshoes, visited neighbors or walked to town for supplies. As usual during winters, the trains were late and had difficulties. The local engine had to help No. 4 to Paradise, which wasn't out of the ordinary in winter. Area residents spent long evenings warmed by the parlor stove, eating apples, making popcorn, reading, and doing needle work until the kerosene lamp was snuffed out, leaving its faint odor to lull tired settlers to sleep. 1. Helen Berray Kirschbaum, tape-recorded oral history, October 1978. 2. Frank Berray, tape-recorded oral history. March 6, 1970; February 15, 1972; and undate interview. 3. Clifford R. Weare, tape-recorded oral history, March 20, 1970; March 10, 1972; June 29, 1973; undated; and 1978. 4. Sanders County Independent Ledger, January 5, 1912. 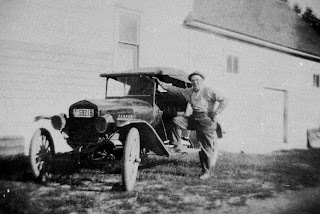 "Dr. Fester" might have been referring to Elmer Fessler who first came to Montana about 1902. Dr. Elmer Fessler practiced medicine in all the valley tributaries to Missoula. He moved his family to Thompson Falls about the time that Dr. Peek retired to Missoula. "Dr. Fessler had at first a small hospital in Thompson Falls. When he would go to the west end of the county, wherever he stopped those people would tell him if someone else wanted him to stop. The only telephone line ran along the wire fences. Eventually he had his car doors painted a bright yellow and people could see the car as he went by." 6. Clifford R. Weare, oral history tape-recorded July 13, 1975. An Irishman named Mike Conners, and a man on Bull River called Frenchy died. The other men remain unnamed. 7. Don Maynard, oral history tape-recorded at a Noxon Home Extension Club meeting, circa mid-1970s. 8. Sanders County Independent Ledger, July 12, 1912. 9. Sanders County Independent Ledger, August 9, 1912. 10. Johnny Knutson, tape-recorded oral history. 11. Harry Tallmadge, tape-recorded oral history, March 7, 1977. 12. Sanders County Independent Ledger, November 21, 1913. 13. Sanders County Independent Ledger, March 13, 1914. 14. Sanders County Independent Ledger, February 20, 1914. 15. Sanders County Independent Ledger, March 10, 1914. 16. Sanders County Independent Ledger, May 1, 1914. 17. Sanders County Independent Ledger, March 16, 1914. 18. Sanders County Independent Ledger, May 15, 1914. 19. Sanders County Independent Ledger, May 22, 1914. 20. Sanders County Independent Ledger, Spring 1914. 21. Letter, Carrie Gore, February 23, 1973. Eddy was a Spanish War veteran. He worked for the railroad until he retired at Noxon. Eddie served in the Armed Services during which he spent a tour in the Philipines. Now and then he talked to the students at the school about the war and his experiences, played guitar for them, and showed off his travel souvenirs. He entertained everyone with his wit and clowning. Carrie cooked in the school lunchroom. "Mrs. Lake and Jim Duffy were the first school lunchroom cooks. They only served soup. Later the farmers and people who had excess garden things donated them to the school. Ladies came in and helped can the fruit and vegetables and then later on they got a few commodities from the government. I think at this time it was 10 cents a meal. Still later the school district furnished the money with the government help and Golda Taylor and help from the high school girls ran the lunchroom. For a long time. Then Golda wasn't able to do it anymore so I was hired as main cook in 1950 and Mrs. Hart as helper. I served seven years." Eddie Gore built two more houses. One was located about three miles west of Noxon on a high hill on the south side of the river; very nice 'A' frame house. The other house was in Noxon, just west of the school bus garage. When nuclear fallout bomb shelters became a national concern following World War II, the Gores turned their basement into a completely stocked shelter. Eddie and Carrie were active church members. They kept their town house grounds a show place of flowers, and they raised prize-winning gardens until age and health forced their retirement. Then they moved out of state to be near their daughter, Cleo. They sold the house west of town to a party from the east by the name of Phillip Bender. Bender was Justice of the Peace for a time. See court case records of Jack James case. Benders sold the place to Mac McQuigans. In 1980 Mr.and Mrs. Zwan acquired it. 22. Sanders County Independent Ledger, October 23, 1914. 23. Sanders County Independent Ledger, November 6, 1914. 24. Don Maynard, tape-recorded oral history, circa 1975. 25. Sanders County Independent Ledger, October 11, 1914. 26. Sanders County Independent Ledger, November 6, 1914. 27. Sanders County Independent Ledger, November 23, 1914. 28. Sanders County Independent Ledger, November 27, 1914. 29. Sanders County Independent Ledger, November 13, 1914. 30. Sanders County Independent Ledger, December 18, 1914.